While working on Castles & Heraldry I visited the deYoung Museum to view “Jewel City: Art from San Francisco’s Panama-Pacific International Exposition of 1915.”1 So with my mind still focused on lords and ladies, knights and valor, I was drawn to this image of a crusading knight in armor dragging his heraldic flag behind him in “The Vanquished”, by George Hitchcock (1898). 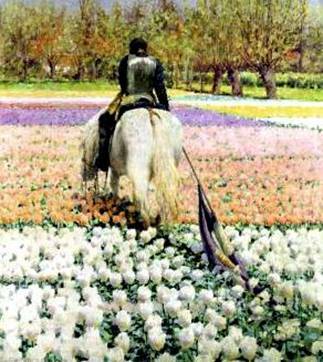 Both horse and rider convey the feeling of exhaustion and surrender. It was one of 200 works of art on exhibition, painstakingly researched and recovered from more than 11,000 works originally at the Exhibition. 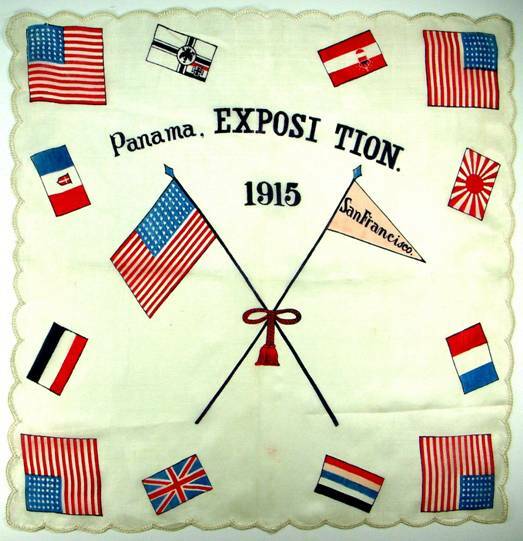 The Exposition was held not only to celebrate the completion of the Panama Canal, but also to show the world that San Francisco had risen from the ashes of the 1906 earthquake to assume her role, once again, as a leading city of the world. 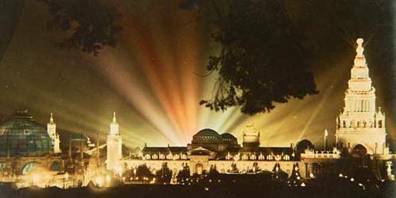 Even though WWI 2 was underway, the fair attracted almost 19 million viewers from its opening on February 20th, until its close in December. The 635 acres included eleven exhibition palaces, twenty-one foreign pavilions, a 65 acre amusement zone, and more. Exhibits showcased the latest in science, technology, industry, education and culture. 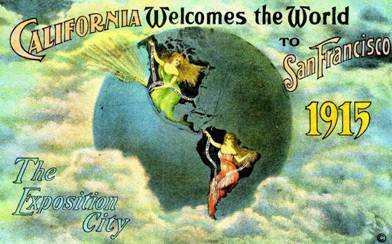 Why was it called the Jewel City? 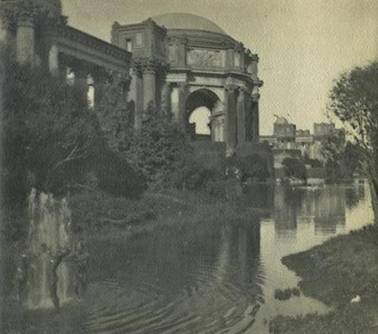 To contrast it to the Chicago World’s Fair of 1893 where the neoclassical buildings were all white.3 Not to be outdone, the San Francisco pavilions were embellished with 125,000 “jewels” of bohemian glass backed by mirrors. When floodlights shone on the buildings at night, the buildings sparkled in rainbow hues. Visitors included Thomas Edison, Henry Ford, Harvey Firestone, Luther Burbank, John Burroughs, Helen Keller and Anne Sullivan, Laura Ingalls Wilder (who marveled at the ingenuity of a cow milking machine) and many more. 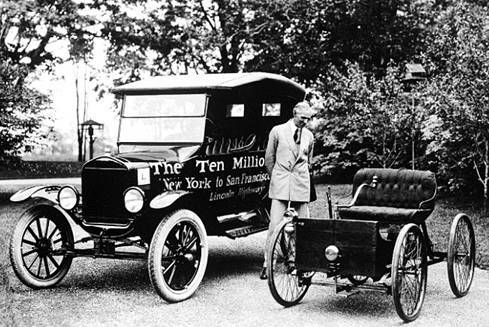 At the Palace of Transportation, you could view an assembly line where a Model-T was produced every ten minutes! Note the crescent shaped building in the lower right hand corner that surrounds a domed rotunda and lagoon. 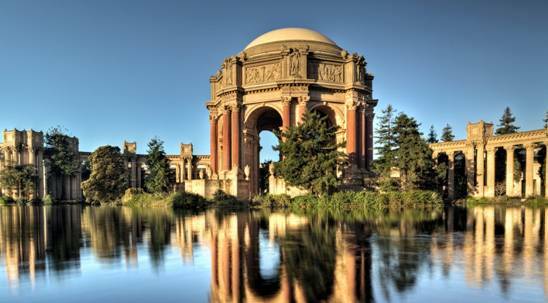 It’s the Palace of Fine Arts, the only building left standing a century later. 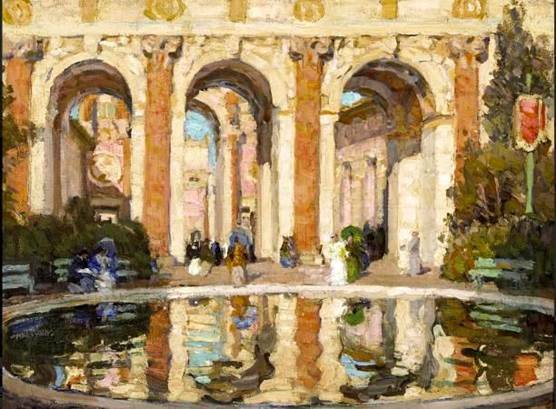 I love this painting of the Palace from the Exhibition. February 20, 1915, opening day of the fair was also the birthday of future photographer Ansel Adams. He turned thirteen that day and received a camera for the occasion.. This picture of the Palace is believed to be the first photo he ever took. From the very start, his eye for composition is evident. This mural by Arthur Mathews has not been seen for 100 years. It was put in storage at the close of the fair, and was only recently restored for the Jewel City Exhibition. A favorite of the crowds in 1915, it represents the “Victory of Culture over Force.” The angel in the center holds back the brute force of war (soldier on horseback) while shining a beacon of light on the gathering of people who represent various aspects of culture. 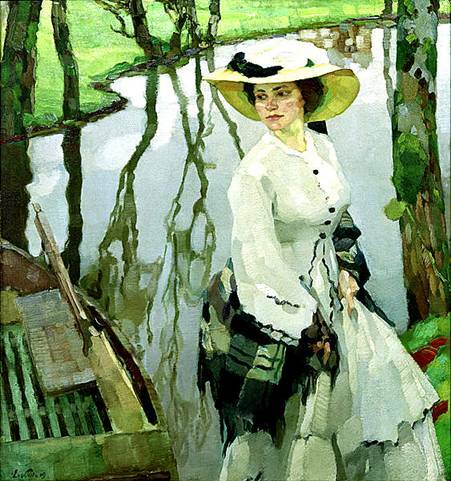 On the Shore” by Leo Putz is one of my absolute favorites. It won the Gold Medal at PPIE, and has quite an interesting history. It was a spoils of war piece sent from a German exhibit to the Carnegie Institute. When it was time to return the piece, the ship returning the art to Germany was turned around by the British, (due to the war going on) so the painting went back to Carneige, which then lent it to the PPIE. Putz did not know he won the prize. Later the Nazi’s called his art degenerate and confiscated it. Putz was a member of the Munich Secession, along with Gustaf Klimt. These studies are for a mural “The Westward March of Civilization” by Frank DuMond. I doubt you’ll be able to see the overlying grid of 1” squares, but each square was enlarged to 2 ft. so you can imagine how enormous the finished piece was. Note St. Francis in the second mural is carrying a small Spanish mission (I’ve added a red arrow). 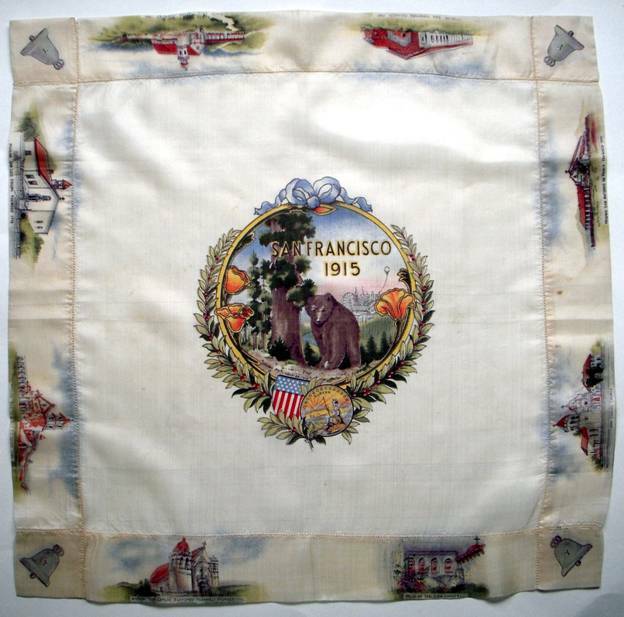 One of my pieces from the Pan Pacific International Exposition is a man’s silk handkerchief 24” square, bordered by the California missions, with a tower bell anchoring each corner. You can see the fair in the background behind the grizzly bear. He’s so soft he looks like a little cub to me. 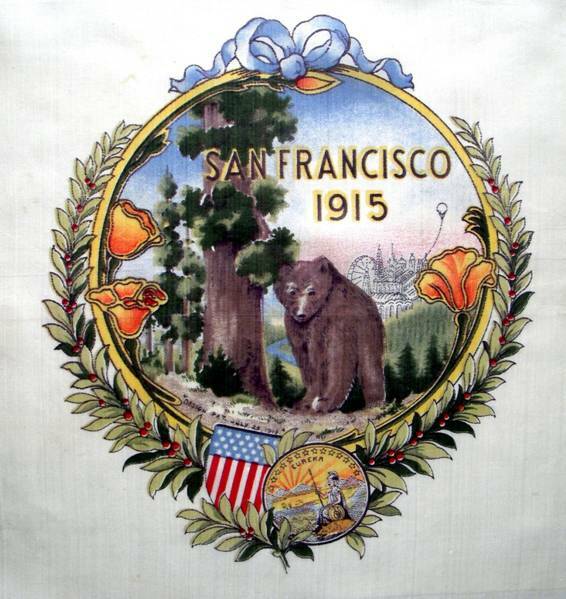 The golden poppy is the state flower, “Eureka” (I have found it) the state motto. The handkerchief above is of the finest silk and the printing is pristine. The souvenir lady’s handkerchief below is made of lower quality silk and was probably reproduced in greater quantities. We’ve all seen bootleg tee shirts at concerts, this may have been a bootleg hankie, who knows? It’s a hoot! Check out the 23 stripes in the American flag, and the spacing in Exposi tion! As always, there’s so much more to these little squares of silk than a simple fashion accessory. In this case there is history and adventure, innovation and artistry, triumph and jubilation which inspired 19 million people who were there to witness the spectacle. Though we may never know the owners of these hankies, we do know they have been treasured and passed on for 100 years, thus we try to learn their history and value, so we may pass them on for a century more. 1 Jewel City is on view until January 10, 2016, so if you happen to be traveling in the bay area, it’s worth a visit. You are most kind. Glad you enjoyed it! Beautifully written and very informative. You’ve harvested great amount of stories that are wide reaching, all from one item: The Handkerchief. I enjoy your blog. Thank you. It’s a labor of love.